GoldenEye Cheats - N64 Gameshark Codes for Multiplayer! GoldenEye gameshark codes for multiplayer for the Nintendo 64 / N64 shooter . "The Best Multiplayer GameShark Codes On The Net"
You want the latest GameShark news? Click here for the new multiplayer levels like Citadel, Caverns Fontzone and Bunker i. 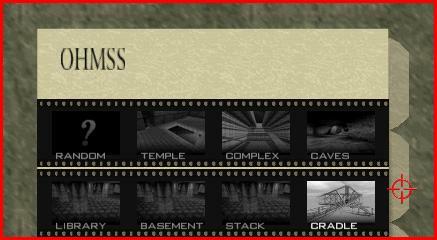 In addition, you can find all the GoldenEye cheats here, plus many cheats that you had no idea even existed! It's late 2008, but lots of new cheats and new levels are being released. Check the resources in the forums for the latest and greatest. Check these out! Many weapons that you see in single player weren't available in multiplayer.....until now. Thank your trusty old GameShark for that! Yes the loud and innaccurate Phantom, deadly Silver PP7, lame Taser, and futile Shotgun can be seen in multiplayer! Check this screenshot to see how easy it is to select some of the new weapons! Nothing beats new weapon GoldenEye cheats! Most of the codes and GoldenEye cheats on this site are huge. I strongly recommend that you try to use a simple cut and paste method. You need a Gameshark Pro that has the port on the back side of the device. Read everything you need to know in this tutorial with screenshots. 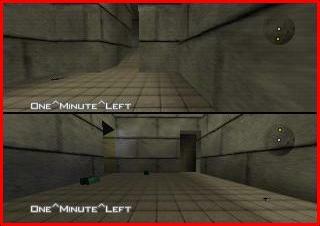 Facility Back Zone in Multiplayer : Codes by Wreck7. For 2-4 players. To see this in action is amazing. The back zone fully playable complete with weapons, ammo, doors, body armour, regenerations and glass. Who would have thunk it? GoldenEye cheats rule!! No Body Armor : Yes, you can now play Basement, Stack, Archives, Facility and Caverns without Body Armor in 2,3 or 4 player games. GoldenEye cheat codes by RSB. All Weapons : Every weapon is the same. In alphabetical order, you can find practically every weapon here. Recommended or "must have" combinations include: All Shotguns, All Rockets, and All Golden Guns. A very popular GoldenEye cheat code! Statue Park In Multiplayer : Unlike most Statue Park in multiplayer codes, you can actually select this level as you would any other multiplayer level. All Multiplayer Levels : Unlocked for 3 and 4 Players. Yes you can now play the leves that are normally darkened out! - You will notice that for the weapons codes, there will be an A, B, C, or D listed with each one. You may only activate one code from each catagory at a time. 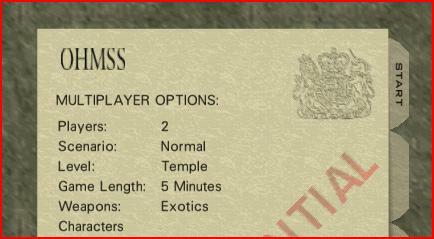 For example, you may activate "(A) Golden Gun Fun" and "(B) Exotics" at the same time. However, you cannot activate "(A) Golden Gun Fun" and "(A) All Shotguns" at the same time. - All codes listed are "cut and paste" ready if you are using your PC with GameShark. - If you have a Version 3.2 or 3.3 GameShark Pro, then you should use the PC for easy code entry. It will have a port on the back of the Gameshark. Use a printer cable attached to your pc's serial port. If you are running WINDOWS XP then you'll have to use these GSCC utilities. You can get the program HERE that will work on operating systems other than WINDOWS XP. Need instructions how to do it? Click HERE. Still can't figure it out? Then email me HERE. Believe me, you want to figure out how to do this! ALL ROCKETS in the unlocked 4 Player Levels (Bunker, Archives, Caverns, Egyptian) for the best performance. Remember the more happening with the weapons, the poorer the framerate and more likelyhood of crashing the game. Choose wisely! For any of the custom weapons sets, you will see the weapon listed like shown here! You won't miss this ONE MINUTE LEFT warning. A must have for tournaments.This is part of the "must have" Standard Settings code. No messing around if you want to play Cradle In Multiplayer or Statue Park In Multiplayer, just pick like any other level. No more excuses! Now everyone can play Oddjob. All Bonds? Yes, that too. 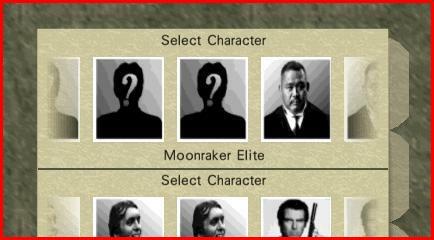 All the character slots beyond Moonraker Elite have been changed thanks to the Extra Custom Multiplayer Characters code. "3&4 Player All Multi Levels"